Themed, self-contained anthologies are one of the best gateway comics for new readers that are intimidated or confused by hundreds of characters and decades of continuity. With a slew of short stories collected all into one place, readers can find characters and creators that they like and dive into available titles with something to guide them. Young Monsters In Love #1 (DC) is exactly this kind of book, following in the footsteps of anthologies like 2015’s Secret Wars: Secret Love (Marvel). With 10 complete comics packed into 80 pages, each one with a different creative team, the book has a lot to offer. As with any collection like this, the individual comics vary in quality and tone. And it’s nice that this isn’t simply a Valentine’s Day book about love, because the added focus on DC’s more monstrous characters gives the individual stories a more unified presentation than they would have had otherwise. There’s the added benefit of highlighting some characters that have been benched or underutilized for years, too. Man-Bat, Frankenstein and his Bride, Solomon Grundy, Raven, Deadman, Swamp Thing, Monsieur Mallah and the Brain, Andrew Bennett of I, Vampire, Etrigan The Demon, and the Creature Commandos all get their time in the spotlight with a wide range of talent showing up to give them life. 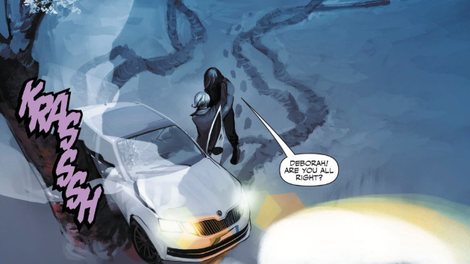 “Buried On Sunday,” written by Mairghread Scott with art by Bryan Hitch and Andrew Currie, is definitely one of the comics that stands out from the pack. Scott gives Superman an opportunity to teach his son a very Kent lesson about compassion and how much grief can impact people, while Hitch and Currie, along with colorist Nathan Fairbairn, deliver the most traditional-looking cape-and-cowl comic in the whole book. Mark Russell and Frazer Irving’s Swamp Thing story, titled “Heart-Shaped Box,” is another exceptional piece. Irving’s typically raw and textured style is the perfect fit for a Swamp Thing comic, leaving the pages feeling lush and alive with greenery while casting the creature that was once Alec Holland into humid shadow. Russell’s work slots right in with what he did with The Flintstones and Snagglepuss, maudlin and melancholic with an undertone of real anger and a capacity for deep, intense love. But while each of the individual stories is well-done, the overall tone of the book falls flat, because, with rare exceptions, they fall in very narrow definitions of both monstrosity and love. Only one story doesn’t star a male character: Collin Kelly, Jackson Lanzing, and Javier Fernandez’s “The Dead Can Dance,” which gives Raven an evening so similar to the last 10 minutes of the 1995 film Casper that it’s shocking they named the male character Dylan instead of Devon. Steve Orlando and Nic Klein’s “Visibility,” about the sentient gorilla Monsieur Mallah and the Brain, is the only one of 10 that’s not about a heterosexual couple, but it also stars literal nonhumans. Even “Be My Valentine” by Paul Dini and Guillem March, which is ostensibly about children bullying each other on Valentine’s Day, tosses in a comment about romance, and the other nine comics are all explicitly about romantic love. The majority are either about or repeatedly mention the sadness felt by a male character at losing his wife or long-term female romantic partner. 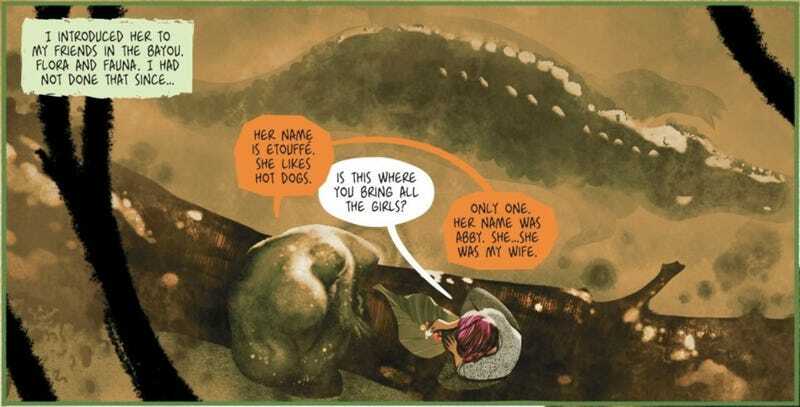 Ultimately, Young Monsters In Love is a fun book filled with strong, well-constructed comics, but it feels dull if read all in one sitting, showing the importance of considering the overall construction of an anthology when commissioning or approving individual stories. Readers might balk at the $9.99 price tag, especially when there are trades available at the same price point, but for the size and quality of the individual stories, it’s definitely worth the investment. Plus, you get to see a werewolf and Medusa punch Nazis.